We'd like to introduce the ultimate gift for the salmon lover in your life. WINNER GIFT OF THE YEAR 2017 by the Giftware Association. Be prepared for total amazement and respect from all directions once you serve your fish to friends and family (if you can bear to share). 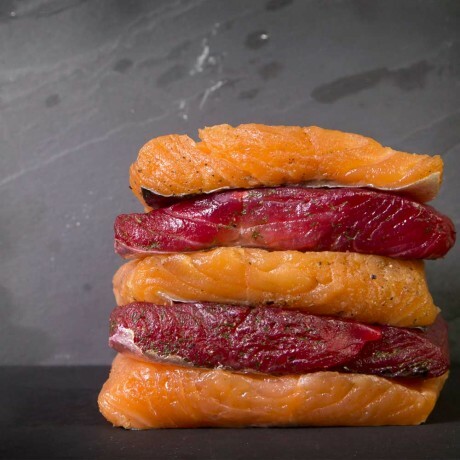 This kit gives even the most culinary challenged the chance to make their own artisan salmon, and grants you bragging rights for being a bona fide British Artisan Food Producer. All you have to do is provide the fish! made from:3 x curing salts - (smoky, gin, beetroot) 3 x sealable bags, 12 x plastic gloves, information and instructions brochure. Does NOT include salmon or gin. Packaging - brown box made from recycled materials, information sleeve. Producers of handmade British food gifts with a manly essence.